Image: Willsie/Getty Images. Design: Ashley Britton/SheKnows. It’s the beginning of a new year: the perfect time to purge. This year, it seems like even more people than usual are organizing and getting rid of clothing and household items to make way for 2019. Why this year, you ask? Well, chances are high folks’ new enthusiasm for cleaning is due in large part to Japanese organizing phenom Marie Kondo. Her KonMari method first gained popularity with her 2014 book, The Life-Changing Magic of Tidying Up, which espouses discarding items that don’t “spark joy” with you. But her recent Netflix series, Tidying Up, is what’s really pushed Kondo’s fame over the top — and has finally gotten mainstream Americans into organizing the Kondo way. But what about parents? Can we KonMari our children’s things? Sure, Kondo describes her little ones jumping in enthusiastically, but what about American kids? Will it really work for their lives — not to mention their amount of stuff? I tackled my kids’ shared dresser to find out. And it turns out, kid minimalism is possible. Yes, even in the U.S. In Kondo’s Netflix show, Tidying Up, the spritely Kondo arrives to tidy the homes of various unorganized Americans. And it’s delightful. Viewers watch Kondo put her methods into action — and apparently those viewers have been quite inspired to do so themselves. Thrift stores are reporting tidal waves of donations attributed to Kondo’s influence. “We can hardly keep up with it,” Florida Goodwill employee Brian Edwards told NPR. And those newly purged homes come with some specifically organized drawers, too: Kondo’s rectangular clothes-folding approach is taking over. She advocates folding items in thirds lengthwise, then folding them twice, creating a small rectangle that can stand up on its own. All the rectangles go back into the drawer, facing up. The result is a tidy drawer that displays all your clothing. It also makes for less wrinkled clothes, since they’re not stacked on top of each other. I’d say it’s pretty genius. I’ll admit I was hesitant to learn a new (seemingly complicated) way to fold, especially since I’m not great at folding to begin with. But it worked, and I really liked the results. So I started thinking that maybe I should tackle the messiest dresser in my house: the one my kids share. (Insert cringe-face emoji here). 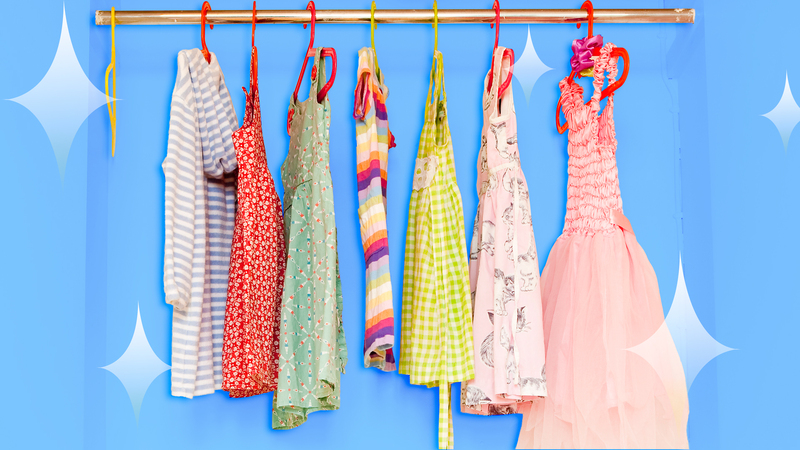 Could the KonMari folding method work on my kids’ overstuffed drawers? As it turns out: Yes, it does work. And it’s awesome. Image: Courtesy of Lindsey Hunter Lopez. KonMari’ing my kids’ clothing wasn’t easy in the beginning. I started with my daughter’s clothes, and let me tell you: Getting a 5-year-old to help organize is not a simple task. First, I dumped everything into one big pile, just like Kondo does. (And it was a huge pile, because I’m a bit of a shopper.) Then, I needed to see whether various items still fit Ruby — but getting my daughter to try things on for size is something I loathe, because boy does she fight it. But somehow, I got her to oblige (OK, a candy bribe was involved). Once we had a pile of everything that fit and Ruby was happily munching on Swedish Fish, I went through things with her to see what “sparked joy,” which admittedly feels a bit silly with a Kindergartener. How is she going to know whether an item makes her happy? Ultimately, having drawers of visible clothing is so, so worth the folding effort. We saw things we had previously ignored simply because they were at the bottoms of shirt stacks or crumpled at the back of a drawer. Now, everything is out in the open, waiting to be chosen and worn. This is weirdly freeing and so satisfying. No more grabbing whatever’s at the top of the pile. Now, everything gets a fair shake. Having more room in the drawers is fantastic, too. I hated jamming things in there and seeing everything cramped. Before they drank the KonMari Kool-Aid, my kids would rummage around searching for things and everything would get rumpled. No more! Now that shirts, pants, dresses and even underwear are visible, the need to throw everything around is gone. Does it get messed up sometimes? Yes. But I’m hopeful that the more I show my kids this new way of storing clothes, the better they’ll be about keeping their things neat. At this point, I can’t turn back. I love these little rectangles too much! Next stop: the linen closet.